Where can I find this stencil? Thread: Where can I find this stencil? I want to buy this stencil and have googled extensively to find it with no success. I'm hoping some of you might recognize it. yes...I've googled its name...viewed hundreds of images...and can't find where I found this pic. I really want this stencil. Feeling very frustrated. I think that is a pantograph for a long arm. I will check out one source and post again. yep..its a pantograph by Anne Bright. I don't think she does stencils. Why don't you try drawing this on paper and then poking holes for pouncing? If it was me, I think I would 'teach' myself by practicing on a white board. I learned how to quilt bees that way. if you go to the site via Buckeye Rose mentioned, just get on the link, you can print it up. I did. You can take each section and enlarge if you want then transfer to your own stencil. It's at this website. Click Fantasy and then click on image #3. Don't think it's a stencil. Oh my, has she ever got a wonderful selection of pantographs! look up continuous line stencils for something similar you could use. good luck. it's cute. Thanks for helping me. 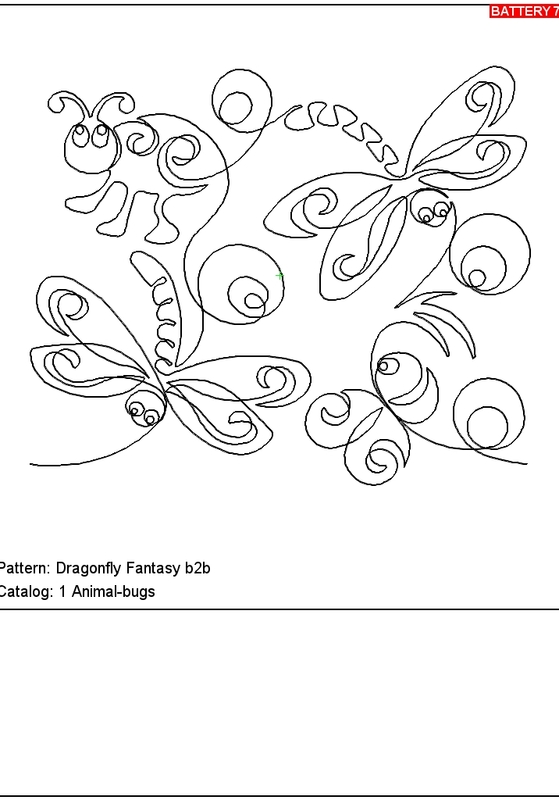 I checked out the Ann Bright site and find that she doesn't offer this pattern in a .pdf file. I've contacted her site asking if that would be possible. My plan is to copy the image, take it into EQ7 and re-size as a pattern for a quilt I want to use it on. I could do that anyway from the pic...but my conscience won't let me not pay for it. So enable to quiet my inside voice, I've needed to find the site. Thanks for helping me do that. I don't know what I'll do if she says, "no." I quess I'll buy a paper one...since I sure don't need the ones with the long-arm machine formats. I have a Bailey Pro 15 and use it in a sit-down situation.